We will be kicking off our Winter Speaker Series with a talk by local wildlife biologist and free-lance writer Jeff Fair. The subject is bears. An authority, Jeff has trapped and radio-collared grizzlies in the Yellowstone back-country. 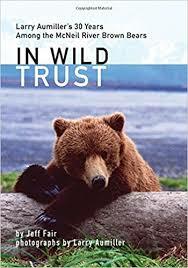 And he recently published a fascinating book titled “In Wild Trust: Larry Aumiller’s 30 Years Among the McNeil River Brown Bears,” recounting Aumiller’s unique respect for the bears and their habitat.Following Jeff’s talk, we will have a brief annual meeting with a look back at our activities in 2017 and our goals for 2018. Then to top it off, there will be delicious refreshments from Turkey Red.